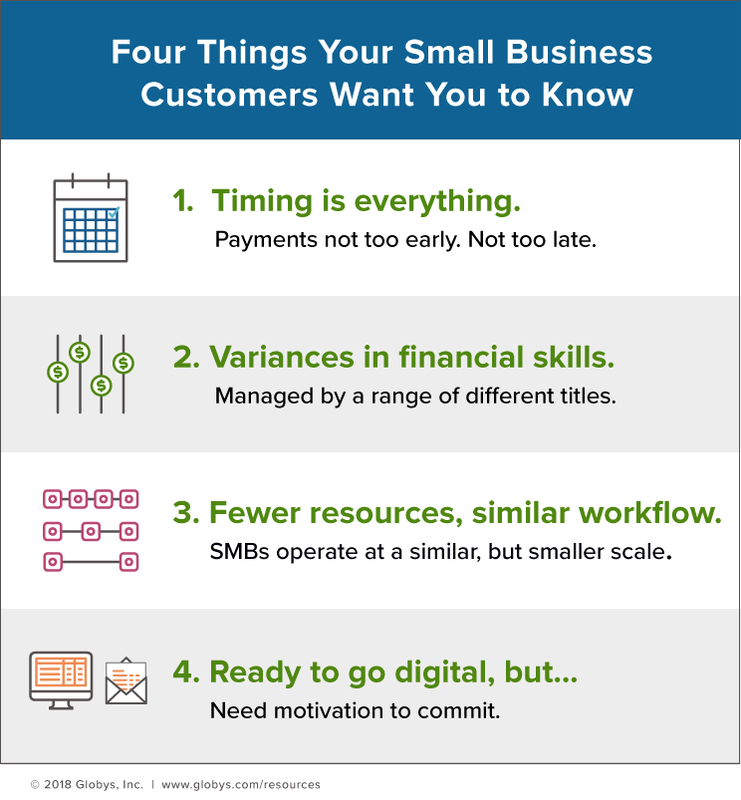 The small business (SMB) segment represents a substantial portion of the business market. For many suppliers, SMB customers represent 80% of the total business customer base. On the flip side, that same 80% comprises only 20% of total business revenues. A lot of customers to serve and support – without a lot of upside or revenue to reinvest. So what do you do when you have an upside down revenue-to-customer ratio (20/80)? You find the most efficient way to collect that 20% – and to keep it coming in. But it’s not just about finding efficiencies within your organizational walls. It’s ensuring your billing and payment experience, specifically for your SMB customers, is tailored to accelerate their invoice payment process. And yes, ensuring they can do so with as little (or zero) support from you as possible. Now for the good stuff. How can this impact your SMB profits? Well, imagine if you could reduce your billing inquiries by 30%. That’s exactly what our client TELUS was able to accomplish – not to mention the resulting impact on customer satisfaction (see TELUS Customer Spotlight). The saying ‘it takes money to make money’ rings loud and true among SMBs. Whether just starting out or a few years in, the alignment of cash flow is of utmost importance. Although your stated due date is taken into consideration, the timing of payment is heavily influenced by other incoming and outgoing payments. On-time payments and maintaining good vendor relationships are particularly important for this segment. Growth and funding is highly dependent on good credit ratings and consistent services, i.e. no business interruptions. The SMB segment represents a variety of businesses, ranging from a local service vendor to a retail chain with multiple shops and 40 employees. This variability also carries over into who is responsible for managing the financial tasks of the business. Some owners take on this responsibility themselves, while others assign the task to internal roles, such as an Office Manager or Accountant, or outsource to a Bookkeeper. These varying business models and roles make it difficult to determine a single ‘experience’ that will work for all processes. For those owners juggling multiple roles, notifications and reminders are key. For those with an outsourced Bookkeeper, it’s ensuring both the business and the Bookkeeper have access to the same information – as quickly and painless as possible. Although the number of employees and revenues may be smaller than their Enterprise counterparts, the workflow in reviewing and paying bills is actually quite similar (see 20-step Enterprise process) – minus the high-tech systems and dedicated Accounts Payable roles. As bills are received, either via paper or digital format, they are forwarded to the appropriate contact who then manages the review, validation, approval, payment, and filing of the invoice. Specifically for SMBs, this remains a highly manual and paper-based process, largely due to the inability to easily gather required data points and to share information beyond the original receiver of the invoice. Is a PDF bill enough? In short, no. Although the static PDF or image view of the bill is helping SMBs to transition to an online experience, it’s not really aiding in any efficiencies for the SMB – or for the supplier. Disputes, inquiries and payments continue to be the top call drivers from SMB customers. Why? A PDF bill offers zero interactivity. Customers can’t dig deeper to find the data required self-resolve questions. Customers can’t pay directly from the bill. And customers can’t personalize the view based on their specific business needs. It’s basically a redo of the paper bill (which by the way a large portion still rely on even when PDF is available). Wondering if your SMB customers are satisfied with the billing and payment experience you’re providing? Have a look at the call volumes coming in from this segment, specifically around billing inquiries and disputes. Run your paperless adoption counts across this segment to see if your semi-digital experience is being used in parallel or as a true replacement to the costly paper bills. And lastly, look at your churn rates among this group. These are all good indicators that you’re tracking to keep – or not keep – your 20% SMB revenue stream flowing.